"A lovely and refreshing salad or appetizer, better if it's allowed to sit and marinate a few days. You can also pop it in a blender for quick and tasty hummus." 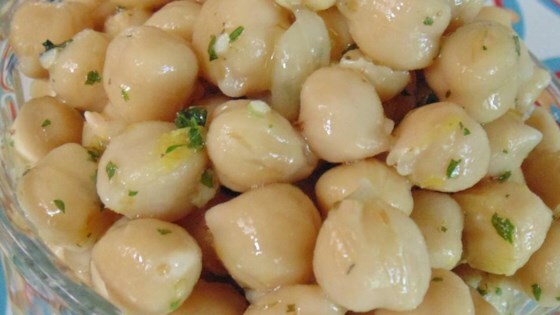 Place chickpeas in a bowl. Add olive oil, oregano, lemon juice, lemon zest, parsley, garlic, and sea salt and mix well. Marinate chickpeas in the refrigerator, 8 hours to overnight. Roasted chickpeas with cumin, paprika and cayenne pepper. I eat it right away. Reminds me of the stuff at the Middle Eastern food shop. So simple and very healthy...thank you for the recipe! This is an easy, tasty snack. Love it!